So what's the evidence that these biomass opponents are many, as the VDT says? We could review letters to the editors in the VDT, but let's look at the visual evidence LAKE has recorded. With no pro-biomass demonstrators anywhere to be seen. Sure, a few people show up at government meetings to speak for the biomass plant, but by my tally they are indeed very few, and most of them are either former employees or board members of the Industrial Authority. Yes, LAKE has posted videos of them, as well: Ken Garren, Nolen Cox. Crawford Powell. Or watch the people at the microphones during the 6 December 2011 VLCIA biomass "forum" and see what you think the ratio is. My opinion is the same as I posted last month: "Black and white, young and old, conservative and liberal, college professors and unemployed". Come see for yourself today outside Valdosta City Hall starting at 5PM. "THUMBS DOWN: To area officials who continue to refer to the opponents of the biomass plant as a "fringe" group. Far more citizens are concerned about the plant than officials would like for the public to believe. Thankfully, the city council allowed them to speak at Thursday’s meeting, but the issue is not going away until their health concerns are addressed." A year ago the VDT was solidly in the pro biomass camp. Guess they didn't like being fed misinformation, any more than the rest of us did. And that was before the VDT said VLCIA illegally made up a document. Rumor has it that there's going to be another demonstration today outside Valdosta City Hall starting at 5PM. Natasha Fast, co-president of WACE, Wiregrass Activists for Clean Energy, explains why she is protesting outside the most recent Valdosta City Council meeting. Protestors wearing respirator masks held signs reading "Biomass? No!" 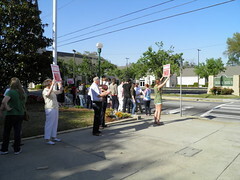 in front of the Valdosta City Hall building on Thursday. 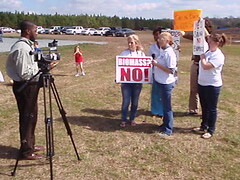 Members of the Wiregrass Activists for Clean Energy, the VSU student organization Students Against Violating the Environment, and other concerned Valdosta citizens showed up to protest the construction of the Wiregrass Power: Biomass Electric Generating Plant. "We already have solar power resources in place that we could be using and I feel like money should be directed towards that," Ivey Roubique, vice-president of the Student Geological Society, said. "It wouldn’t be good for the community and even though I’m in college here it still matters." The Spectator article quotes from two speakers for whom LAKE happens to have video, linked below. Regular meeting of the Valdosta City Council, 24 February 2011. I'm the president of Students Against Violating the Environment at VSU. I'm here representing 200+ members of SAVE, that consists of students, faculty, community members. We are deeply concerned with environmental issues and we are networking together to make this city a more humane and sustainable community for future generations. As a student, I feel I have the right to be able to breathe clean air at the college I attend. With this biomass plant possibly being built here, the future for generations to come are in jeopardy, and we want to protect our fellow and future students' health. Please take into consideration the future health of this university and its community, and don't sell grey water to the proposed biomass plant. She said who she was, who she represented, how many, what they were for, what they wanted, quickly enough that attention didn't waver, slowly and loudly enough to be heard, and briefly enough to transcribe, with pathos, logic, and politic. Even the mayor looked up at "As a student...."
A small example of following up on citizen suggestions, but who knows? maybe it's a sign of much more to come. In the comments by council members at the end of the 24 March 2011 Valdosta City Council session, member Tim Carroll thanked George Rhynes for his suggestion to put district numbers on council members' name plates so citizens could more easily tell which was their council member. Caroll raised his plate up so everyone could see it has a number on it, too, now. Other Council members also commented on various things. George suggested the district number labels on 20 January 2011. "500+ signatures from community members and organizations"
"...furthermore a response to our request each member of the council is expected before the next council meeting." Regular meeting of the Valdosta City Council, 24 March 2011. It's Sunday, so let's see what a local preacher thinks about the biomass plant. Mayor Fretti asked if there were any Citizens Wishing to be Heard, and a preacher said, "yes". No, not Rev. Rose. 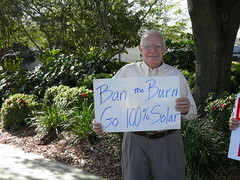 He last spoke to the Valdosta City Council back on 10 February, and left in disgust. Besides, the Council thinks people are frightened of little old him. How do you adhere to your mission statement?